Always good to see a feature video of 76084. Can't wait to see footage from 4 Feb next year when she doubleheads on the main line through to Buxton!! Back in July 2013 at the Return to Steam speechifying our President, Steve Davies MBE carried with him a carrier bag and with the phrase "If 76084 cannot go to Lower Darwen then Lower Darwen has come to 76084" he proceeded to take a brick out of the bag. The brick he assured us was from the site of the former Motive Power Depot. Making himself available for the Loaded Test run on Tuesday, 20 September 2016, what better way to start the day than by ceremonially shovelling his Lower Darwen coal into 76084's firebox. And so a momentous day for 76084 and all involved in her restoration, return to steam and now return to the mainline loaded began. There are numerous videos of the Loaded Test Run around the Carnforth - Blackburn - Carnforth loop on the internet. Click here to view a playlist. Footplate crews work in quite a warm environment and our cab is equipped with a roof ventilator to ease the crew's discomfort in really hot conditions. We did ask and were quite surprised when the job list came back and was over 80 items in total. Granted some of the jobs were small and could be completed in a short time with little expense but there was the other extreme. One job that typified this was to check and test all locomotive and tender springs - 12 in total. 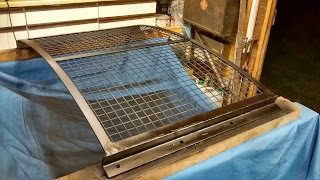 The tender springs are on the outside of the tender frame and are physically smaller than the 6 locomotive driving wheel springs which are inside the loco frames and much more difficult to handle being larger and therefore heavier. 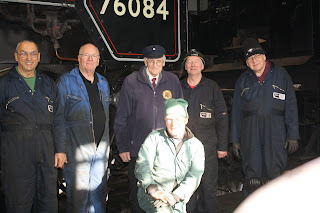 During Week 2 with Roger Norris, John Riley and me affectionately know as the 'Spring Team, all Loco and Tender springs were refitted with tender springs receiving coat of paint to spruce them up. Whilst Dave Husband and Mel Rutter put lots of effort into refitting both Mechanical Lubricators and Atomisers after they had been serviced. They were tested and refilled with correct lubricant. All Driving Wheel and Pony wheel axlebox underkeeps were drained, cleaned and new side felts fitted. New ‘Armstrong Oiler’ Pads were also fitted. The 'Steam Brake Cylinder' was removed in Week 1 and refurbished before refitting in Week 2. This is so very easy to say in one sentence but the effort taken to do the refurbishment and refitting was huge. I can now point to a steam break cylinder on my OO gauge model of 76084 and inform those in earshot how much work goes into fitting what looks like a tiny piece of equipment. The front end of 76084 was not overlooked during this Winter Maintenance with a new Front Draw Hook purchased and fitted, this was followed by a modified AWS guard plate being fitted to protect the equipment from impact damage by the front screw coupling. The Front buffer beam was rubbed down by ‘Billy Wizz’ and repainted by Brian Ashby, NNR Painter to a very high standard. The fitting of the new Smokebox 'Self-cleaner' components has been started by NNR staff. This is an important piece of kit as it will minimise the possibility of lineside fires in hot weather on the main line – something that Network Rail are REALLY sensitive about. In the case of the tender taking on water on the main line is fraught with issues so low level fillers have been completed by NNR and the pipework given several coats of paint during Week 2. All 6 Tender 'Timken Bearings' have been carefully greased.